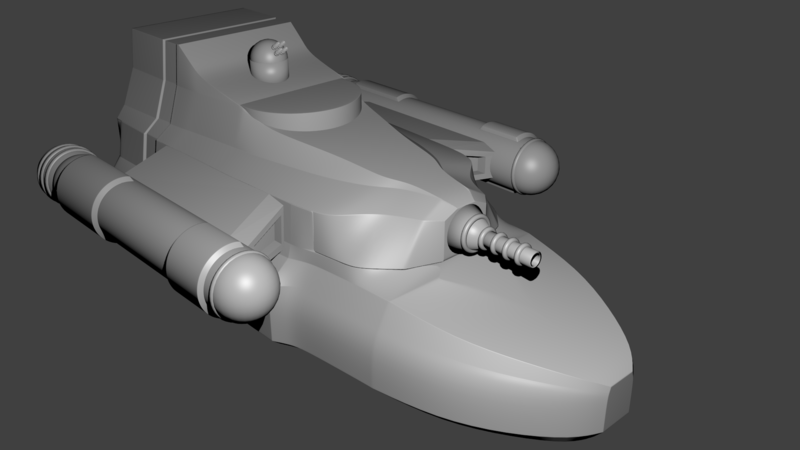 In part 2, we ended with the final version of the hull model for the Scavenger Transport and all that was left was to add in some of the details, most notably the doors and other bits that extended through the hull. After that, it is just “decorations” to add a little character. Adding in the bay doors was straightforward. They are just basically rectangles after all. For the smaller shuttle and workpod bay doors toward the back on the lower level, I added a split vertically down the middle for the doors to open and swing outward on the sides. For the larger cargo and runabout bay doors, I decided that they would open top and bottom so the seam detail runs horizontally. In the case of the cargo bay doors, the lower portion of the door can double as a loading ramp if necessary. Next I wanted to break up the hull a bit so it wasn’t so plain and I created a little triangular design that I placed on the lower and middle decks for and aft of the ion cannon as well as on the wings. I then added a cylindrical structure on either side of the second level. Next, I added a bit of a domed structure on top of the runabout bay. Finally I created some large (2m diameter) portholes and placed them on the back of the ship on deck two between the cargo bay and runabout bay. These are positions to be in the rec room at the back of that level and the two cabins back there as well. Back of the ship with the bay doors and portholes. You can also see some of the other details mentioned earlier. At this point I was looking at the model and thinking it was looking pretty good and then I realized: I forgot to add in all the bits and pieces that stick out through the hull! Again these were fairly straightforward as they are fairly simple shapes. I tweaked the block that was the sensor array extension as it was sticking too far out. The rocket launcher (deck 1, starboard side) may get some tubes added to it for the missiles to launch out of in the future, but for now, I just left it as a solid block. I also rounded the edges of the airlock a bit. Speaking of the airlock, after adding it in, I realized it was really poorly placed. It’s right up against the wing and behind the front part of the engine. Luckily the wing didn’t overlap it at all. I didn’t even consider it’s placement when I made the wing so I was lucky I didn’t have to go back and tweak that. It probably would have been better to put it on the lower level toward the front of the ship. I guess the engineers weren’t thinking too hard about how the engines were going to be placed when they designed the fuselage :-). However, its poor placement gives a bit of flavor and something to hassle the crew with (and for them to grumble about). It truth, it’s more of a backup measure anyway since the ship isn’t designed to actually dock at stations but rather pull up next to them and transfer via the shuttles and open cargo bay doors. So in practice it’s only a minor annoyance. Once I had these last structures added, the ship was all done. With the physical model done, it was time to start testing out 3D prints. 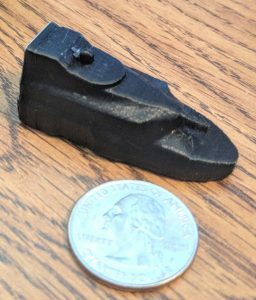 I started with a simple small, low resolution print. This was done at 0.2mm/layer and at the native scale of the model (1/1000 scale). It only took about 50 minutes. You can definitely see the print layers on the model. There are also hints of the details on the body, wings and engines although the size of the features are such that they just don’t show up at at this scale. This particular print was done with the bottom of the ship on the build plate. That may not be the best way to print as we’ll see in a minute. If you look closely at the larger print, you can still see the layer lines although since the print is bigger, they are not as pronounced. 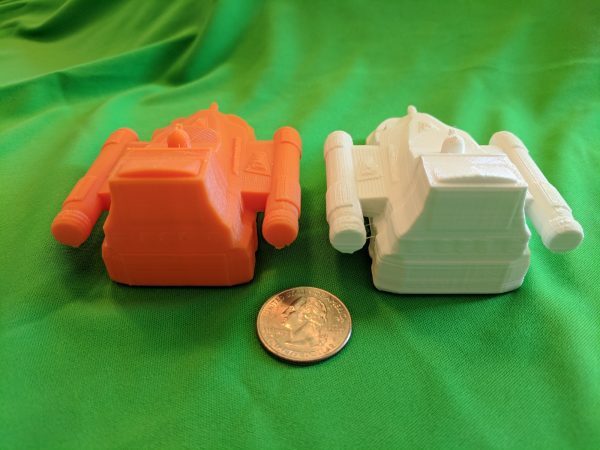 You can also see the turrets on the laser battery print at this scale. They were just too tiny to print on the smaller scale. You’ll also notice that the assault scout model in the back looks super smooth. That is because it was printed at 0.1mm/layer and was printed standing up. the back of the orange print has some issues. 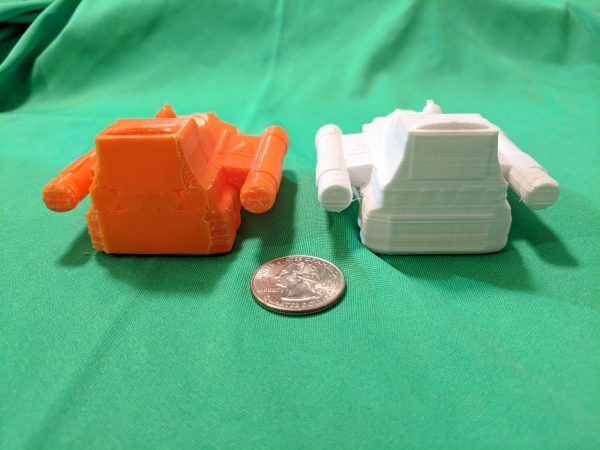 Granted the back of the white one isn’t the best, as you can see some issues with the layers of the print being slightly misaligned (I need to re-tighten the belts that drive the print head or slow down the print). However, you can see the detail of the bay doors and the portholes (barely, they should probably have been a bit thicker for printing). On the orange print, this was the side toward the build plate and so had to have supports to the parts of the model that were suspended. In this case that is the back of the engine and wing as well as parts of the back of the ship. The bits on the engine and wings again are not completely cleaned up but they are flat surfaces in is orientation and much smaller surfaces as well. They will be much easier to clean up than the rough sections on the white print. The back of the ship is a different matter. The surfaces of the cargo and runabout bay doors were the only parts actually touching the build plate. The rest of the back of the ship and the portholes were raised slightly. Because of that the printer had to lay down support material. However, because they were only slightly raised (like one or two 0.1mm layers), there really wasn’t that much room to print support material and it is all fused together. It could probably be cleaned up with some work but it would be pretty tough. 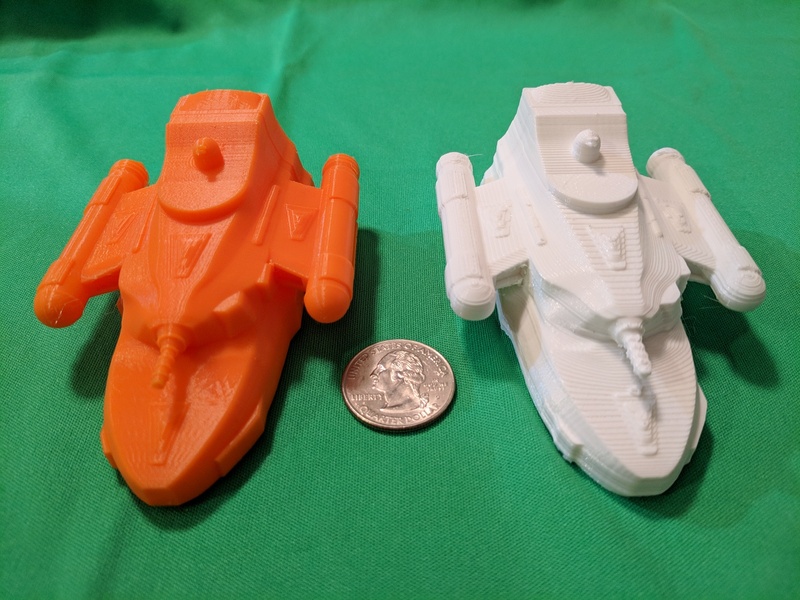 Finally I did a last print at the higher 0.1mm/layer resolution with the ship on it’s bottom (same orientation as the white print) just so see how that higher resolution affected the look. Those bottom surfaces are still fairly rough although I think they are better on the higher resolution print. The back of the higher resolution print is definitely cleaner. 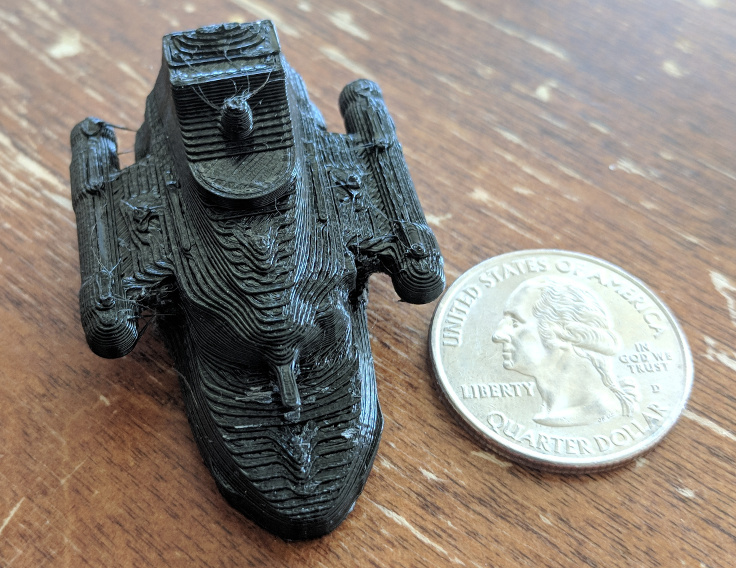 I think the print with the ship on it’s back is still the better way to go, but barely. It’s a tough call and I could be convinced otherwise. 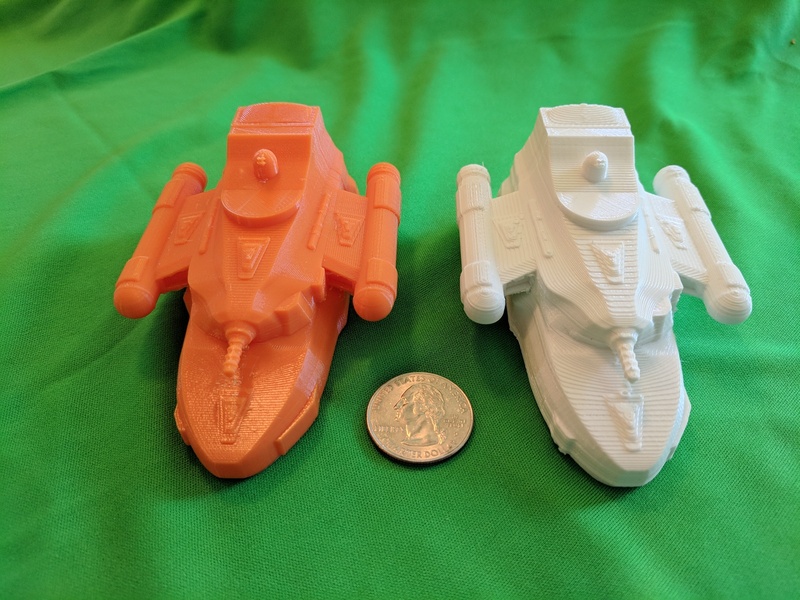 To address the problem with the support material on the back of the ship, I have a couple of options. One is to just remove all the surface features on the back of the ship completely. That would give a flat surface to print and would eliminate the problem but you would lose the details on that part of the unpainted model (you could always paint them back on). Another option would be to just eliminate the portholes. There is enough relief to the doors that you could trim the support material from around them. The rest of the back of the ship might be a bit rough but it is an easily accessible area to sand and clean up. The final option would be to increase the relief on everything, both the doors and the portholes, so that there is a bit more space there making the support material easier to clean off. I haven’t decided which route I’ll take yet but I’ll probably do some experimenting to try out the different options. My Patreon supporters have already received a copy of the model file as it currently exists (that’s one of the perks of being a supporter). At some point I’ll put the model up for purchase for those that would like to get a copy (That will be on DrivethruRPG and either here or my New Frontier Games website). 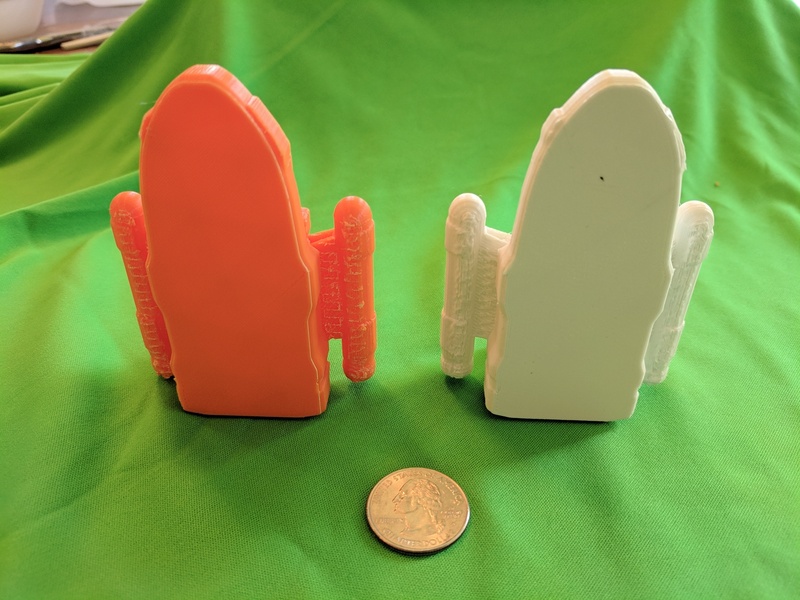 I’ll also make 3D printed models available. That will come once I’m comfortable with the way the prints are coming out. 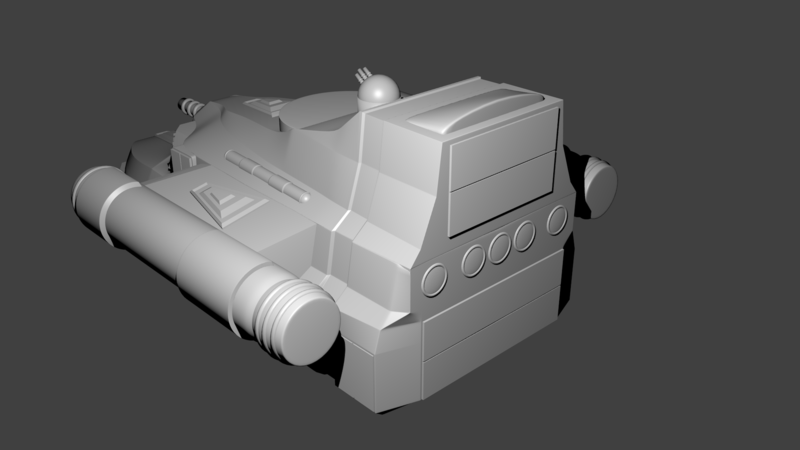 The next step for the model is to back to the digital model and paint it so it can be used in 3D renders. I need to add textures and materials to the model to give it color and life. However, I’m going to put that bit on hold for bit as it’s not really needed for the module (and I want to go over the Blender tutorial on how to do all of that stuff. I have some experience from the assault scout but it was very trial and error). So this project will probably go on hold for a few weeks while I work on some other bits and pieces. Bill is also working on the final versions of the deck plans and I’ll post a copy of those once they are available. Let me know if you have any questions, comments, or suggestions below. More progress on the ship model. If you haven’t read part one of this series, that describes how I laid out a model of the interior of the ship as a skeleton to build the hull around. In this post, I’ll actually start building the ship out. Let’s dive right in. I started by pulling the skeleton model I exported from OpenSCAD into Blender. The first thing I noticed is that Blender likes to work on really small scales. The model isn’t that big, only about 50mm long, half that wide and tall but it was was huge in the default view port. I had to zoom way back. With that loaded, I can start forming the hull around it. It all starts with a cube. I created a cube the height of the cargo bay and then stretched, extruded, and molded it to fit around all the rooms and sections of the lowest level. Once that was done, I extruded part of the top of that level up to form the basis of the hull around the middle deck and then stretched and molded it to properly fit. Finally I did the same thing for the uppermost layer. In modeling the hull, I had it extending out beyond the bay doors on the sides and back so that they were inset from the hull slightly. The circular bridge area on the upper deck was modeled as a separate piece. With the hull done, I created a model for the ion cannon and the laser battery and placed them in their appropriate positions on the model. When I was done, it looked like this. It looks pretty good. But for some reason, I just didn’t like it. I think a big part of it was that it felt too smooth. I could have turned that down a bit but I still didn’t like the shape. There were bits of the hull that just looked weird up close and had somewhat strange geometries. One was the the bit of hull on the left and right side of the bridge “window” area. If you look closely at the image, you can see that it dips back down between the outer edge of the hull and the bridge proper. There were some other areas like that on the back of the ship and around the hanger bay doors as well. So like all good prototypes, I threw it out and started over. The only thing I kept was the bridge, the laser battery, and the ion cannon. With a little more experience under my belt, I decided to start over and try again. I kept the original version around in case try 2 was worse but I didn’t expect it to be. This time around I decided that instead of trying to do the hull as a single piece of geometry, that I would break it up in to connecting pieces. While I had originally planed to do five pieces (one for each deck and two for the spaces between decks), I ended up only doing two overlapping pieces as you’ll see below. This time around I decided to make the outer hull on the back and side be flush with the cargo, shuttle, workpod, and runabout bay doors. I’ll probably add a bit of overhang to those but that detail will be added to the exterior instead of built into the basic hull shape. Regardless, I created a lower deck model that I was much happier with than the first one. Once that was done, I started a second section of the hull and modeled everything on the second level except raising it to the full four meter height of the room containing the machinery for the ion cannon or the area that would connect the engineering spaces to the engines proper. The former would be done as part of the connection between deck 2 and 3 and the latter when I actually modeled the engines. Once I was happy with the second deck it was time to connect the two. My original plan had been to created a completely separate piece of geometry to make the connection but sitting here with the two pieces in front of me, I decided to just extend the top of the lower deck and form it into the shape I wanted. So I extruded the bits under the second deck up and got to shaping the hull. In the end I didn’t just stop this modeling at the bottom of deck 2 but because of some of the feature that I wanted to continue extending, parts were modeled all the way up to the top of the second deck. Satisfied with that, it was time to move on to deck 3. Again, the original plan was a separate piece of geometry but since this level was fairly simple, I decided to just extend the top of level 2 upward. I was several hours into the project at this point and feeling comfortable with the tools so it went fairly quickly. Since the bridge area, laser battery, and ion cannon were already done, I just had to turn them on. Doing so made me realize that the area where the cannon was attached felt a little two boxy so I tweaked the design a bit there. I also needed to tweak the geometry around the bridge to expose a bit more of it. With that done, I ended up with this model for my second attempt. You’ll notice that this one is much blockier than that first one. In that first attempt I had already applied some smoothing filters before exporting the image. I had not yet done so on this one and had first planned on leaving this one as is. I thought this looked pretty good so I even exported this as a 3D model and did a small test print. I was quite happy how the print turned out. The barrels on the laser battery were too small to print at this scale (1/1000) but otherwise it looked pretty good. However, looking at the actual model some more I decided I didn’t like it so faceted. Plus if you look at the back of the ship, there is that little bit of contouring that is pushing in a bit. That section fills the space between the doors for the shuttle and workpod bays. I decided that I wanted that to be a feature that ran all the way up the ship. So I went back into the model and started tweaking. First I modified bottom part of the upper deck geometry to continue running that feature all the way up the aft portion of the ship. This was actually fairly easy as at this point in the ship, the outer edge of the hull is well beyond the interior walls. After that was added, I started smoothing out the surface and adding edges and features in where I wanted the model to have sharp edges. I ended up with the following model. The one thing that adding the smoothing did was somewhat highlight the fact that it is two different pieces of geometry. You can see a slight seam between the two pieces in the area under the ion cannon. It runs around the front of the ship and back to the point just in front of the bulge mid-ship on the lower deck (that bulge is the location of the reflec screen on this side of the ship) where it turns upward to the top of the second deck. This seam is not visible in the unsmoothed version as it is an artifact of the extra facets added to the geometry to make it smooth. It’s something I’ll need to clean up. I haven’t decided exactly how I’m going to do it but I have two options. One is to go in and tweak the geometry so that the two pieces (with the smoothing) line up better. That is actually what I did on the back half of the ship. You can’t see the seam back there. The other is to put surface details, such as pipes, equipment, etc. that run over that area of the ship to mask the region affected. It will probably end up being a combination of those options in the end but that is for later. The other thing you can’t see in this image is that there is a bit of hull under the lower deck. It actually extends about a half a meter below the deck but it is beveled inward so it doesn’t really show up in the angle of this view. And the bit that is visible (just below the front of the bow and below the parts jutting out a little on the side) are in shadow from the lighting. This extension allows for some machinery and piping beneath the hull and the addition of landing pads as well. Now that the outer hull is done, it’s time to add the engines. I didn’t really have any ideas for a design on the engines, I just knew they needed to be big and were going to be outboard on either side of the ship. So what I decided to do was use the engines depicted on that map at the end of the last post as a model. I imported that image into Blender to use as a reference and got to work. Here it is again. I’m going to match the silhouette of those engines at the top and bottom. 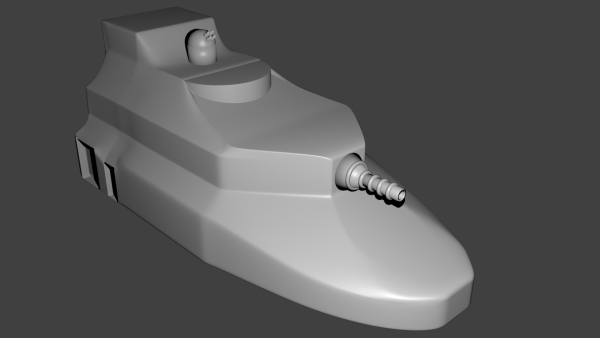 In this case, I am only going to model one engine and then mirror it to the other side of the ship. The engine design is fairly simple. It’s mainly a cylinder with a spherical cap at the front and an exhaust cone at the back. Plus some decorations along the side. I made a couple of variations on this image for the model. First, the exhaust cone at the back is symmetrical on my model I might go back and add that curve to it later but for now I left it alone. I also added some tori around the exhaust cone section of the ship reminiscent of the ribbing on current day rocket engines. 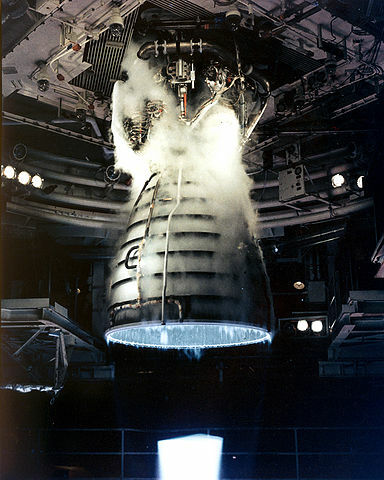 Image of the test firing of a Space Shuttle main engine. (click image to link to original on Wikimedia). I also added one around the connection point between the cylinder and the sphere at the front of the engine (to mask the seam that shows up there when I applied the smoothing 🙂 ). For those bits of geometry sticking out on the sides, I modeled them as extensions that ran a little more than half way around the engine instead of all the way around. To connect the engines to the ship, I created some simple swept forward “wings”. All of these pieces were then smoothed and added to the model. 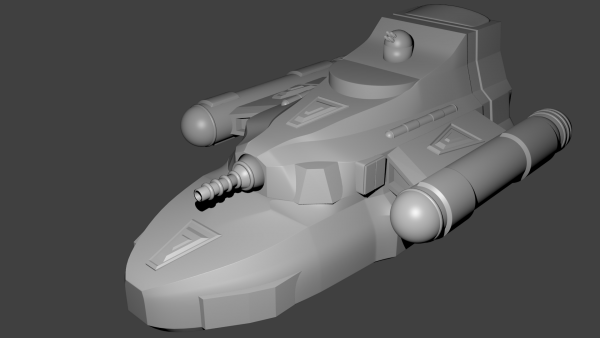 With that done, I had the final model of the base hull ready to go. Now that the base hull is done, it’s time to add the details. That will be the subject of the next post. First up will be those bits of the interior rooms that actually extend beyond the hull. On the side face in these images, the grapple launcher extends a bit out of the bow of the ship. On the other side we have the rocket battery launcher on deck 1 and the sensor array and airlock on deck two. After that, I need to add in all the bay doors on decks one and three. That will complete the full basic structure of the ship. At this point I’m going to do another 3D print. 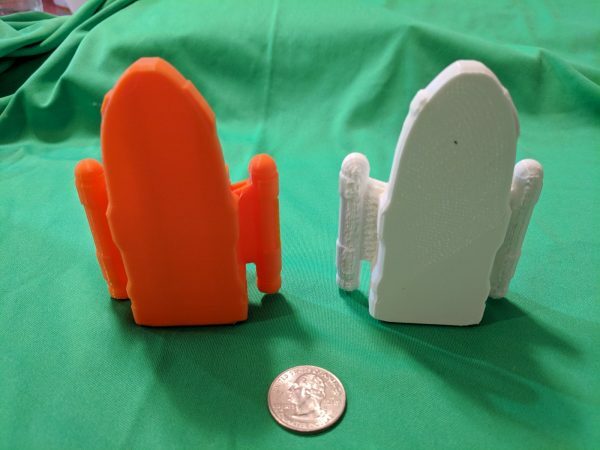 At the small scale that I used for the first test print, that is all the detail that might show up. Any other smaller details would only show up on a larger print. Once those final necessary features are added on, I’ll go through and add some other details and features to break up the completely smooth surfaces just a little as well as some recessed landing gear on the bottom of the ship. While the ship doesn’t normally dock or land on planets, it is capable of landing on smaller, very low gravity objects so I need to add that feature in. So what do you think about the design? Any additional features you think should be included? Let me know in the comments below. Now that the basic deck plans are done, I want to make a 3D model of the ship. I’m going to be posting this as a series of small articles as I work on the model so you can see the bits and pieces as they happen. Let’s get started. I’m going to be trying something new for this model. Well, new for me at least. I’m going to attempt to create the model in Blender. I’ve used Blender a bit in the past but only to add materials and textures to an existing model that I created somewhere else. Never to completely create the model from scratch. In the past I’ve done all my models in another program called OpenSCAD. It has some features that I really like (as described in this post on the Arcane Game Lore Blog). But it also is fairly simple and I’d like to have the extra control an options available in Blender. If you want to see some of the other things I’ve created, check out the 3D Modeling/Printing category over on the Arcane Game Lore Blog. That includes several posts I’ve made on the subject. So we’ll see how this goes. I’ve been working through a Blender fundamentals tutorial on Pluralsight and feel comfortable with the basics that I think I’ll need to create this model. If all else fails, I can fall back on OpenSCAD. In truth I’ll be using both of those tools in this project since I can export objects from OpenSCAD into Blender. 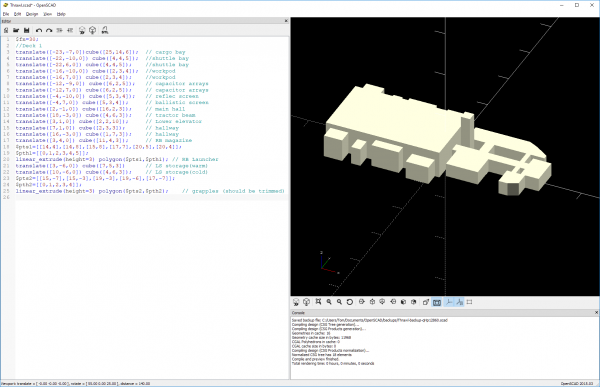 So for parts and pieces that make more sense to create in OpenSCAD, I’ll be using that. For this ship, the first step was to lay out all the interior pieces in their proper size and position. This is what I’m calling the skeleton of the ship. Once that is done, I can build the hull around the interior structure so that it is all properly contained. This is one of those cases where OpenSCAD is just going to be so much easier to use then Blender. Since we’re talking about adding in basic geometric shapes in very specific, defined positions, the programming interface to OpenSCAD that allows me to specify the position and dimensions of basic shapes like cubes, cylinders, and spheres is exactly what I need. I work on these models at 1/1000 scale. The default units in OpenSCAD are millimeters so I just use the sizes of the rooms in meters as my values in the functions. This naturally gives me that scale. I can always scale it up (or down) later as needed. For tabletop minis to be used in a tactical game, I typically create the model at 1/3000 scale so I just have to scale the final model by 1/3. For display models, I can scale it to anything I want. To begin, I just pulled up the deck plan for deck 1 (the lower deck, see this post) to use as a reference. OpenSCAD needs an origin so I selected the center of the grid to be (0,0) in the horizontal directions and the bottom of the deck to be 0 in the vertical direction. I could just have easily selected the lower left of the deck plan but thinking ahead, I knew I would want the origin on the center-line when I got into Blender so I chose appropriately. I then just started adding in boxes to represent the various rooms in the ship. The cargo bay is 6 meters tall. The little side rooms off of it are not quite as tall ranging from 3-5 meters in height. The forward section of this deck has 3 meter tall rooms. And the elevator shaft connecting this deck to the upper one can be extended 10 meters up to intersect the middle deck. Here’s what things look like after adding in this first deck. On the left is the OpenSCAD code. On the right is the actual render of the code as a 3D model. The large block sticking up high in the middle is the elevator shaft to the next level up. On the first level, I added in each room individually. On the middle level, there are a lot of rooms that are adjacent forming large blocks. These areas I just added as single large bits as there was no need to make them all individual. This model I’m creating is just really a sort of wire-frame and will not be part of the final model. It’s more of a guide. The room for the Ion Cannon machinery is 4m tall instead of the standard 3m and is so represented in the model. Here’s the model after this deck has been added. Those little bits sticking out on the sides are the access tunnels to the engines. Those might very well change as I start modeling but for now, I’m just reproducing what’s on the sketches I drew. Somewhere out there will be engines. Again the bit sticking up is the elevator shaft to the next level. Finally we need to add in the upper deck. This one has the 6m high runabout bay aft with all the other decks being 3m in height including the round bridge area. Again this deck has a bunch of adjacent rooms that form large blocks. 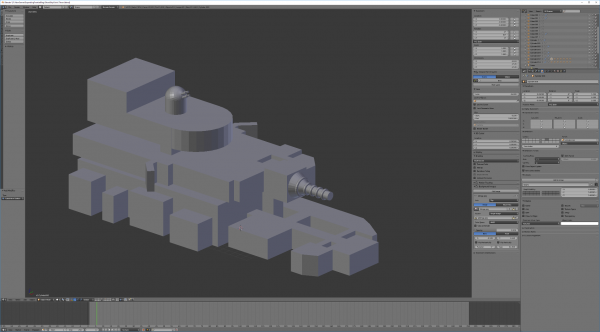 In fact, it only took three shapes to model this: the large block for the runabout bay, a cylinder for the bridge, and an block connecting the two to represent the other rooms. Here’s the model with deck 3 added. Nothing really exciting here. Although now you can see how the ship sort of tapers toward the middle and the back as you go up to the higher levels. Finally, I wanted to add in the exterior weapons: the Ion Cannon and the Laser Battery. 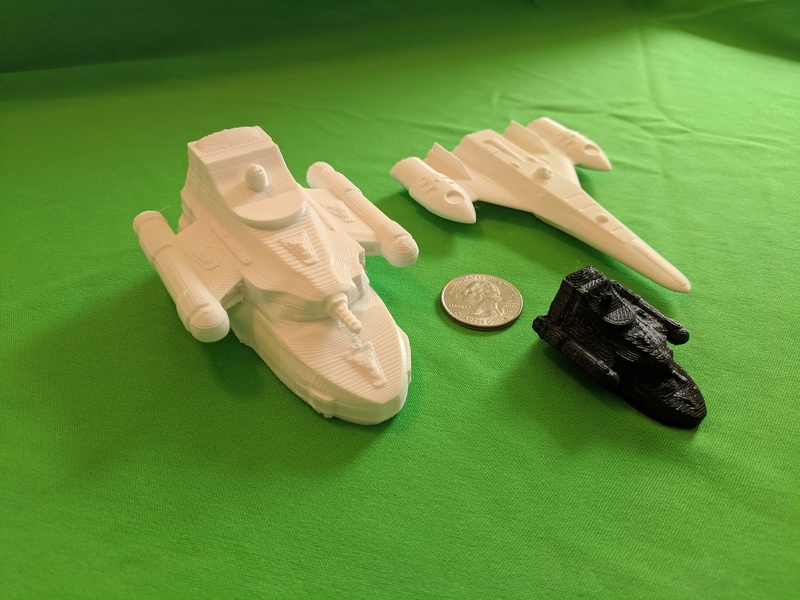 So I went in and modeled those to scale and put them on the ship. Having these exterior elements will help me to get the hull placed properly. With the weapons added, I now have a completed model of the interior of the ship as well as some of the exterior features I need to account for. Here’s the final model. Making the weapons was kind of fun. I may just export those out to use in Blender. It depends on how hard it is to make the tori around the barrels. Now that the model is done, I can create an actual 3D object and export it for use in Blender. That’s it for this segment of the modelling process. Next time I’ll pull this skeleton model into Blender and start shaping the actual hull around it. Let me know if you have any questions, comments, or suggestions in the comment section below. I’ve been working on the antagonist’s ship for the Ghost Ship Osiris module and now have the basic ship design down. This is a larger vessel, used by Thrawl and his scavenger crew to collect materials around the frontier and transport them for sale. 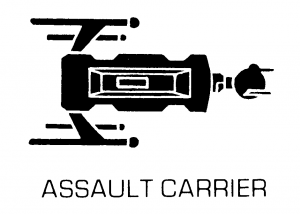 It’s relatively well armed and with the larger crew, can even take on smaller vessels if it wants to. I still haven’t come up with an actual name for Thrawl’s specific instance of this ship but am simply calling the general ship type the Scavenger Transport. In this post I’ll talk about how I designed the ship. It starts by deciding exactly the roll the ship is to play. I knew I wanted it to have a large cargo area, a bigger than normal crew (to provide muscle in scavenging operations), be relatively well armed, and relatively fast for a vessel of its size. 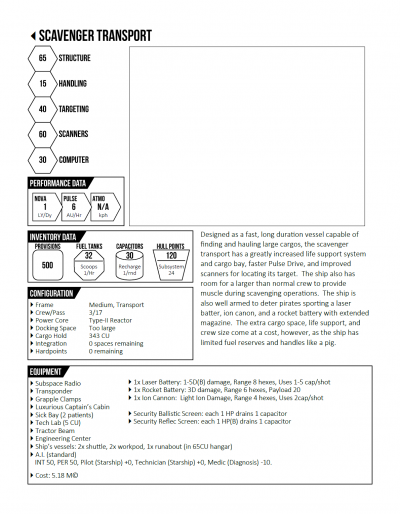 The last bit is because in the module, it needs to be on par speed-wise with the PCs’ ship. 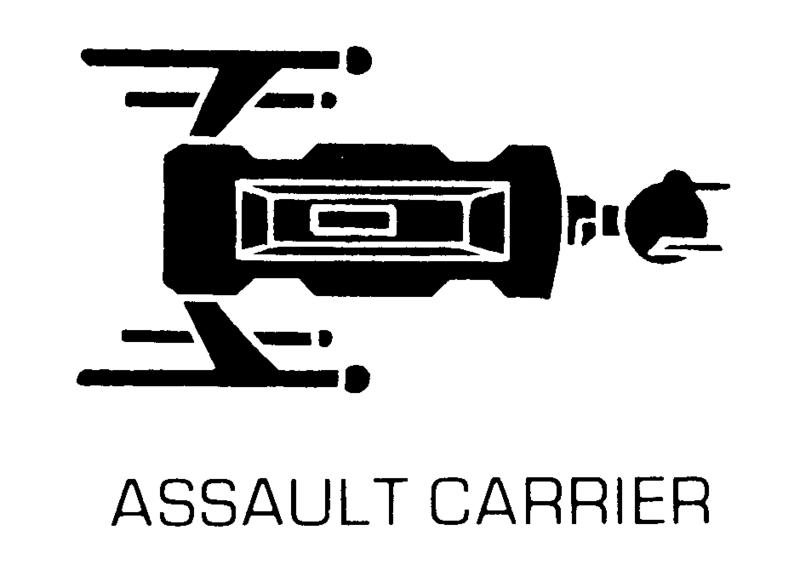 And a fast, armed ship isn’t too bad for a crew that works a bit on the shady side of the law. Also the ship has to be able to carry a smaller personal runabout for the captain, again needed for plot reasons. Given that basic plan, I sat down with the FrontierSpace rules and started picking out systems and features of the ship. Now to be honest, I had a bit of behind the scenes help as Bill has created a spreadsheet to use for basic ship design that helps a lot. That tool is not generally available but I believe Bill is working on a more detailed starship generation system that the basics provided in the core rules. In any case, I was able to determine all of the ships systems, components, and statistics using the spreadsheet. Using that information, I created a basic ship characteristic sheet. There’s no picture of the ship yet as I haven’t completely designed it and don’t know what it looks like. 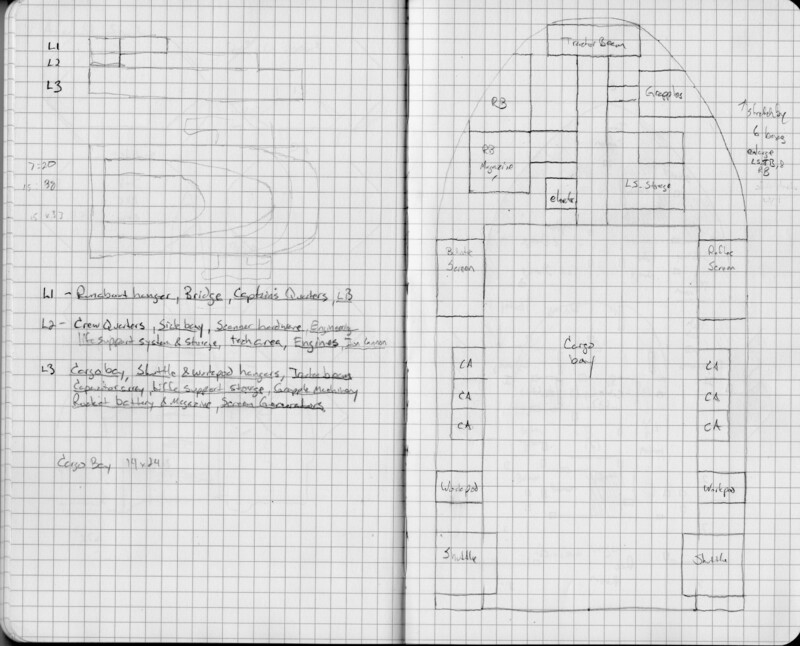 But now that we have the specifications for the ship, we can start working on the deck plans. As I do with most of my ship designs, I start with paper and pencil. 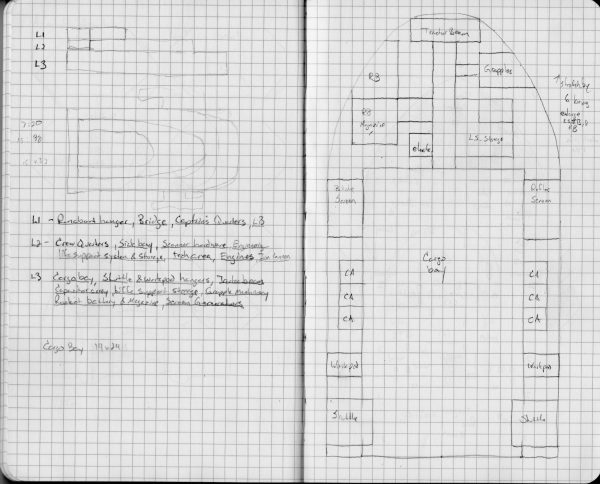 I have a nice little Moleskin graph paper notebook that I use to sketch out ideas and designs in so I started by drawing a side and top view of roughly what I wanted the ship to look like. It can be seen here in the upper left of this scan of two of the pages from the notebook (Note: on this an all other images in this post, you can click on them to get them at their full resolution). The initial plan was to have three decks, each smaller than the one below forming a somewhat pyramidal or wedge shape. The larger box in the back that spans the upper two levels was to be the hangar for the runabout. The lower level would be taller than the other levels as it contains the cargo bay. Once I had the basic outline, I started mapping out what I wanted each level to contain. I basically went through all the specifications and figured out which deck the machinery, storage, and hardware would be for each of those systems. You can see that list in the middle of the first page. Level 1 (bottom) – Cargo bay, shuttles and workpods, and many of the ship’s weapons and defenses along with other bulky systems such as life support and power storage. Now that I had the basic plan, it was time to start getting into details. I started with the lower, largest level which can be seen on the second page of the scan above. On limitation of working in my notebook (which is 8.25×5 inches, 5 squares to the inch) is that there is only so much space to draw in. I probably should have sketched at 2m/square but did the sketch at 1m/square. I stared by working out the cargo bay size. Assuming that one CU from the game rules is about a cubic meter, I figured out how big the cargo bay needed to be (see the notation on the left page) give that the bay itself was 6m in height. From there I started adding in the other features that were supposed to be on the ship. After I finished this deck I compared it to the top view sketch that I created. I realized that the width matched pretty well assuming that the sketch was done at 3m/square except that the detailed sketch was 6m too short. So I made a note about that (on the upper right) to remind me to stretch it out a bit when I finally got down to drawing it. With the lower level done and an approximate scale, I started in on the next two levels. I actually skipped deck 2 to start and did the upper deck first. The reason for this is that I needed to know where the deck access would be so I could connect everything up. I knew I wanted the bridge at the front of the deck spanning the entire width and the runabout hanger at the back. The Laser Battery is actually mounted at the top of the ship so I put it in the center of the deck. I wanted a conference/meeting room off the bridge that was also connected to the captain’s suite. Picking the left side for the conference room determined where the Captain’s Suite would be. That put the elevator on the right and I added in the main computer, some life support space and small toilet off the bridge. This deck was done. On deck two, I knew I wanted to put the crew cabins and living area in the back of the ship and the working areas center and forward. I actually started this level by putting in the two elevators (one to the deck below and one to the deck above) so I knew how the rest of the design had to work around them. Next I added in the engineering spaces around where I wanted the engine access tunnels to be. Then came the location of the Ion Cannon (which extends out the front of this deck, not shown) at the front of the deck and then just started filling in details. Also you might notice that I don’t have the roundabout hanger extending down into deck 2. It would have filled the space where the rec room is and a bit more. That was because as I was doing the sketches, I didn’t look back at my side view (the deck sketches were done several weeks after I made that side view sketch) and I completely forgot that that was my intention. So I decided to just extend it up more instead of down, making the ship even more pyramidal in shape. Now, if you’re paying attention, you may have noticed that I forgot a fairly important feature that any good spaceship needs. (I probably forgot several but one is definitely going to be added in). Can you spot it? I’ll call it out when I get to drawing up the level it occurs on. With the sketches done, it is time to start in on final drawings. I do my drawings in Inkscape and if these were going to be the final plans for this ship, they would end up with much more detail that you’ll see here. However, I knew that for this ship at least, I would be sending of the drawings to Bill to create the final version. The reason is that he has a specific style that he has used for ships in FrontierSpace that I can’t quite recreate yet. He had already done the PCs’ ship for this module in that style so I needed him to do the final drawings to match. More on this later. But that means that all I really need to do is get a good working drawing with the spaces mapped out for him to work from. I like do do these drawings at 50 pixels per meter and 100 dpi. This is mainly due the fact that I started doing maps in Inkscape to digitally recreate some of the original Star Frontiers maps and those maps were all a two squares per inch. 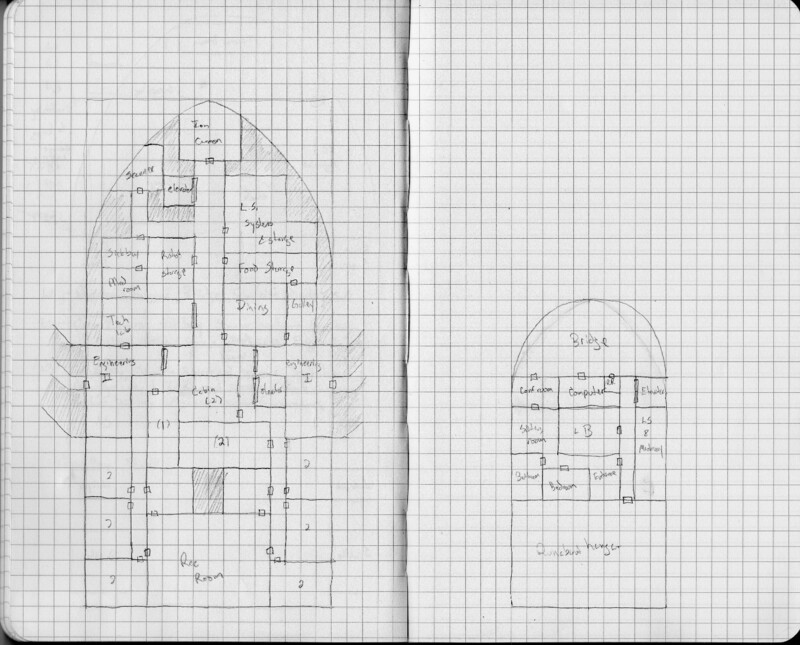 Give the preponderance of virtual table tops and the need for maps for those systems, I should probably shift to 70 pixels per square since that seems to be the default for those systems. However, since Inkscape is a vector drawing program, it’s really easy to scale the final map up (by 40%) to reach the desired scale. So I’ll probably stick with what I’m using since the math is easier. You’ll notice that the sketch doesn’t go all the way to the end of the grid. Remember I said I needed to stretch it out? The final grid is larger than the sketch to accommodate that. Next we lay in the outer hull. This is done on a separate layer. 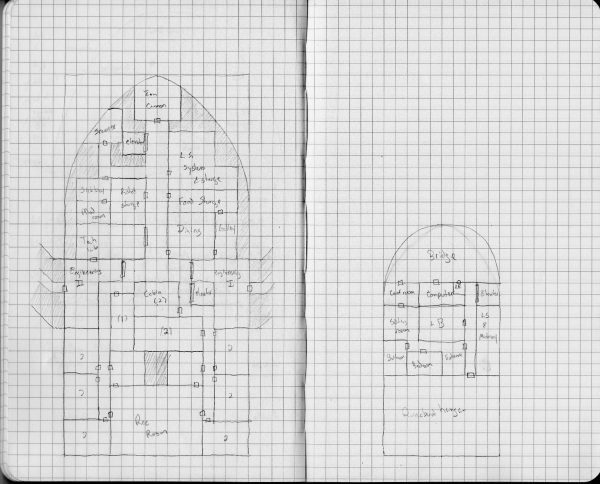 In the final drawings, the hull will probably have some final thickness and shape to it but for now, It’s just going to enclose the space where the rooms and passages will be. Some may stick out slightly but it provides the overall shape. On this deck, the sensor and airlock extend outside the edges of the hull boundary I drew. This ship isn’t designed for atmospheric flight so that’s not a big deal. 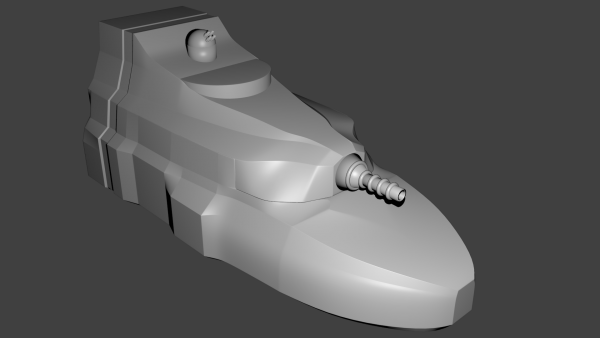 I also added in the barrel of the ion cannon I didn’t add in the engine areas, just a small passage headed out to them. The engine compartment will probably actually start right on the edge of this map or just off it. They aren’t all that far away from the ships. From looking at these plans, you may have noticed that there seems to be an awful lot of life support and food storage space. That is intentional. If you look back at the ship stat sheet, you notice that it has expanded life support. The ship is designed to be able to spend a long time out in space without returning to port so it needs lots of space to store food, air, and water as it doesn’t have a complete recycling system, only a partial one. Finally, the top deck. This one’s not that interesting, just a bunch of rooms with a small passage connecting them. Finally we need a cross section view that shows how all these things are placed in relation to each other vertically. As I said before, the cargo bay and the runabout hangar are going to be taller than the rest of the rooms on the ship, each with a 6m tall ceiling (most of the rooms off the cargo bay will be this height as well). The other rooms are going to be 3m in height. The other decision I had to make was how much space to place between the decks. 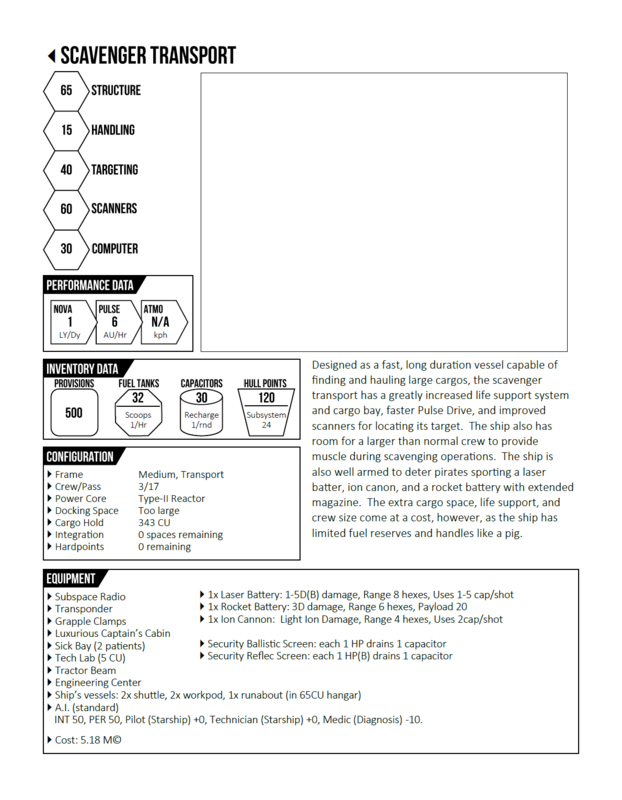 When I’m building ships for Star Frontiers, I typically use 2m between decks. However, for this ship, I decided that the minimum spacing would be 1m (you’ll see why I say minimum in a minute). That gives room for piping, duct work, machinery and such between the levels. That’s also what that big 2x3m area in the middle of the living quarters section is for, to allow for connections between the lower and upper levels. You can see in the front of the ship, there is a lot of space between the lower deck and the deck above. That’s why the 1m was only a minimum. You can also see the laser battery there at the top. The outline of the ship at this point is really rough and I’ll updated it later once I have all the details. With the basic plans done, I’ve sent them off to Bill to get the final treatment. He was quite excited to see the ship and get to work on the plans so hopefully I’ll have those back relatively soon. I’ll post them when he sends them to me. 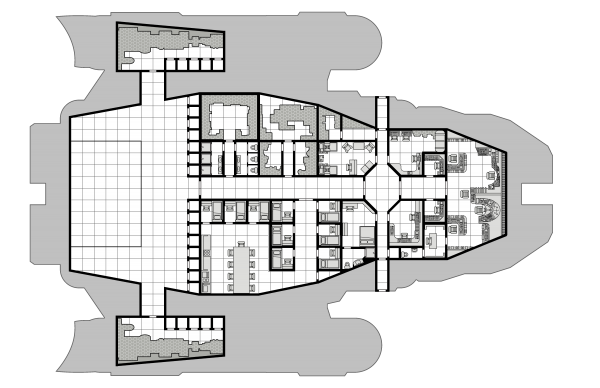 In case you haven’t seen his deck plan style, here’s the PCs’ ship from the game in Bill’s FrontierSpace style. I now have the original drawing for this particular ship so I’ll be working in the future to be able to match it for future drawings. My plan at this point is to start producing a 3D model of the ship. With the basic plans and design done, I can start working on a model that accurately reflects it’s shape. There will be a bit of back and forth between me and Bill as I work on this so that the outline on the deck plans and the model match. Expect the next big post in this series to be on the creation of that model. I’ve been working on brushing up my Blender skills as I’m going to attempt to create the model with that software instead of OpenSCAD which I’ve used for all my models in the past. 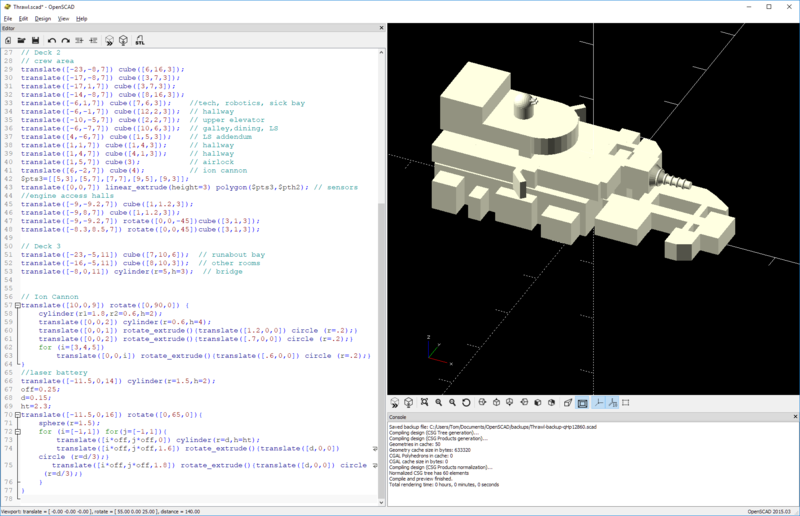 I like the programmatic aspect of OpenSCAD but Blender provides much more flexibility. However, I might do a hybrid approach like I did with the Assault Scout model I used in the Assault Scout Technical Manual. So there you go. A new ship. It can actually be used as is in your games if you want. Everything from here on out is details. Let me know if you have any questions, comments, or suggestions in the comment section below.